An epic place without scale or relativity. Somewhere on this terrible volcano are the remains of a jetliner, which crashed after taking off from New Zealand on a sight-seeing tour. I was on another plane, a CL-130, when I took this. The ""L"" means it lands on skis. It has no proper windows to speak of, but I managed to befriend the loadmaster who got me into the cockpit for take-off. 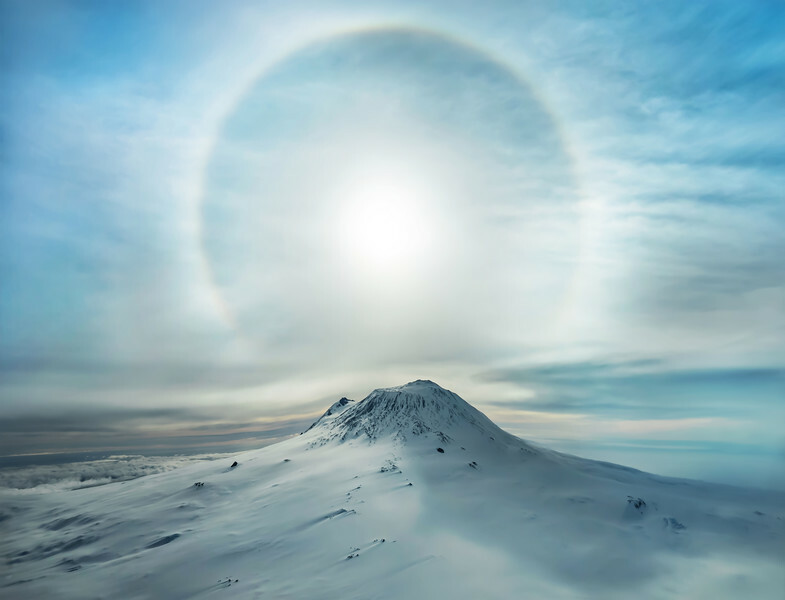 Quite by chance, there was a polar sunbow that appeared over this most dreadful and awesome of volcanos. There is nothing that erupts new earth as close to the Antarctic pole, so to soar over it in peace was surreal. The white sun seemed to welcome everyone below and above.